Like many people whose parents were born during the great depression, I was raised with the adage “waste not, want not…” as a permanent echo in my ears. This seems to be a value we’ve lost. How often have you cleaned out the fridge or pantry and discovered a whole basket load of food that needs to be thrown out because it’s either past its ‘use by date’ or has, at the very least, seen better days? Have you ever totalled up the cost? In the spirit of not wasting anything, if I can help it, I do my best to ensure perishable food gets used as it comes through the door rather than going into the fridge but there are always occasions when I find myself with food that either has to be used today or put in the compost tomorrow. Being frugal, I find a way to use it today! Bananas are a regular feature on that list. They seem to go from not quite ripe to over-ripe in the blink of an eye. 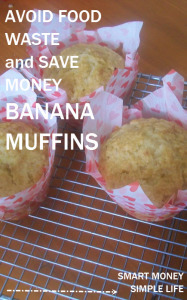 Other than peeling, chopping and freezing the bananas for future use, here’s one of my favourites for using over-ripe bananas. Perfect for breakfast on the go, too. Mix milk, egg and melted butter together in a jug. Using a knife, stir wet ingredients into dry ingredients until just mixed. Spoon mixture in muffin pans and bake for 15-20 mins for normal size muffins or 25+ minutes for Texas sized. I usually sprinkle some rapadura sugar on top before baking for some added texture. Makes approx 12 standard half cup muffins. What food item regularly features on your throw out list? Why? And, can you find new ways to use the ingredient rather than throw it out? Asking these questions and then acting on the answers is just another way of being smart with your money and taking control of your food budget. Most importantly though, money you don’t throw out is money that can be invested in financial freedom for yourself and your family. If you really want to save money on your food bill, consider going vegan (also brilliant for lightening your load on the environment and on your conscience by not harming animals). A diet of staples such as (in season) fruit & veg, tinned or dry pulses (lentils, chickpeas etc), grains (rolled oats, quinoa, rice), add some dressings and sauces and there are endless meal combinations. We include a number of vegetarian meals in our weekly menu. Plus, we try to grow as much of our own produce as possible.